Time and again, the technologies that comprise our HVAC industry have changed. New installation techniques, not to mention whole new concepts for ventilation, make their impact felt on a yearly basis. It can be difficult at times to keep pace with the fluidity inherent in our industry. Perhaps strangest of all, it is difficult – in fact quite impossible – to find a comprehensive textbook or reference book that compiles the “tribal knowledge” of HVAC industry into a single document. The fact that universities offer little in the way of HVAC programs hasn’t been helpful to our line of work either. Time and again, it has been up to individual HVAC engineers to take apprentice technicians “under their wing” to teach them the A-to-Z of all things HVAC. Thanks to Gerry Price and Price Industries, that has changed. 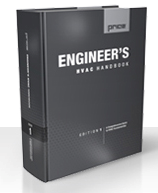 Price has developed an Engineer’s HVAC Handbook that takes an HVAC designer through all the ropes and rigors of air distribution and HVAC Fundamentals. Two years in the making, with over 50 team members compiling 20,000+ hours of HVAC facts and figures, they incorporated 60+ years of data and experience from venerable organizations and associations such as ASHRAE, AHRI, NVLAP, AMCA, and others. Weighing in at 1,300 pages, with over 1,000 separate illustrations, and reviewed by 26 external reviewers in order to insure unbiased content, at last, our industry has a locus point for its knowledge. You could call it the Encyclopedia HVAC-ia (though we would not recommend it). 16,000 copies of the book have already been sent out. Let me know if you, your employees, or your students would be interested in the handbook.